The views on Black Pink's new MV is climbing up rapidly and has set a new record. On June 15, Black Pink made their hot comeback with 'Square Up' containing two title tracks "DDU-DU DDU-DU" and "Forever Young". 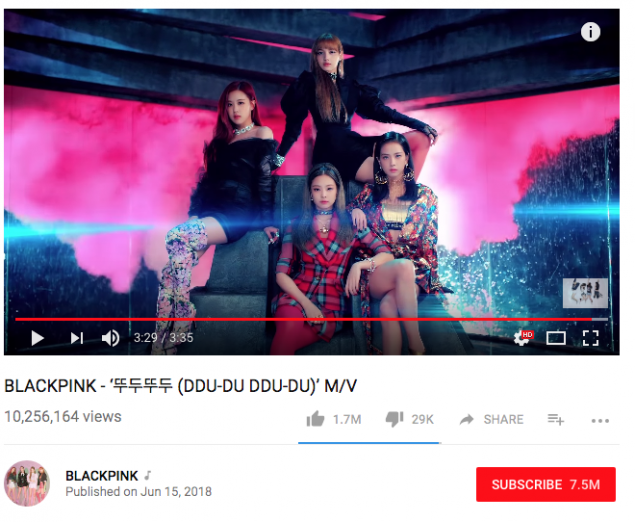 The MV for "DDU-DU DDU-DU" reached 10 million views in just 6 hours. The record is 11 hours faster than Black Pink's MV for "As If It's Your Last" which hit 10 million views in 17 hours. Black Pink broke their own record as the fastest girl group MV to hit 10 million views. BTS' "Fake Love" has the all-time record (not just in K-pop) for the fastest to 10 million views as the boy group reached it in just 4 hours and 55 minutes.